We can help you design your perfect window dressings, supply fabrics and linings, and make and erect your new style. We also offer advice on interlinings, tracks, poles etc. We can make fixed pelmets to any size - padded and upholstered. We are happy to help you choose whichever style suits your home and lifestyle, from gorgeous traditional Swags and Tails to modern contemporary designs. Traditional or contemporary, the choice is yours. With a vast range of fabrics to choose from, any type of window furnishings are available. We can supply all kinds of tracks and poles. Design and fit tracks or poles for bay windows. Design and fit all kinds of pelmets for fitting Swags and Tails or Valances. 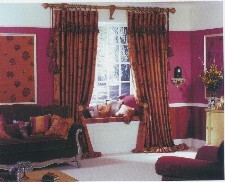 Design and fit upholstered Valances.